Welcome to TMG: Games For The Holidays That Will Last All Year Round! As you are all aware I love me so board games. I have a huge closet filled with all types, from children’s must haves to total adult chaos. But not Monopoly…. Don’t ever bring me a Monopoly board- bad thing happen when my family plays including such famous lines as “There are rules for a reason Jenn.” I’ll show you rules…. Anyway, off the point here. This holiday season I have four great games that are brand spanking new that are worth the money and have high replay value. 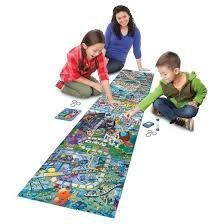 Ravensburger line of Eye Found It! Games have come out with another character license MINIONS to shake up the long-loved game! Hop in Lucy’s car with all your favorite minions pal and travel of the beloved world of Despicable me! Travel on a wild road-trip to race to the end of the GIANORMOUS 6ft game board to find some of the over 1,000 hidden objects to find that will help you on your way to being the winner! 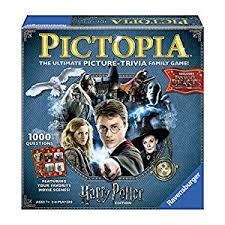 The characters along with the highly detailed board make this not only a great game for the whole family, but us adults like it as well, and with a price point of $19.99 our wallets will love it even more! update with all the movies and books up to 2017 including Fantastic Beasts. The luck of draw can give you a really hard in-depth question or one that is more simplistic which is great for the cooperative play that the game incorporates as well. The board is beautiful and as with all the games from this company is very sturdy and well made- which is good because it is going to be reused many a time. Games range from about 30 minutes to an hour depending. Awesome game definitely pick it up! Also $19.99 and available at Target . 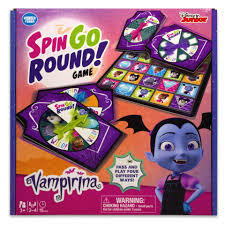 Vampirina is the newest in the long line of Disney JR. television program hits and this game is going to blow up right beside it! Aged appropriately at 3 and up Spin and Go by TMG’s favorite WonderForge is a awesome twist on bingo that the lil’s will love! With brightly colored pictures of the cast as well as two spinners (we know how much the kiddos and adults love to spiiin) this game is easy enough that the kids will catch on quick but not too easy that they will lose interest. There is that fine line- that WonderForge gets every single time with all their games- it’s not easy guys but hey nail it! So, everyone spins to see where you can play on the board the kids need to match the color patter shape OR character in order place a piece, then if you spin on Spin Go Round triangle everyone switches spinners!